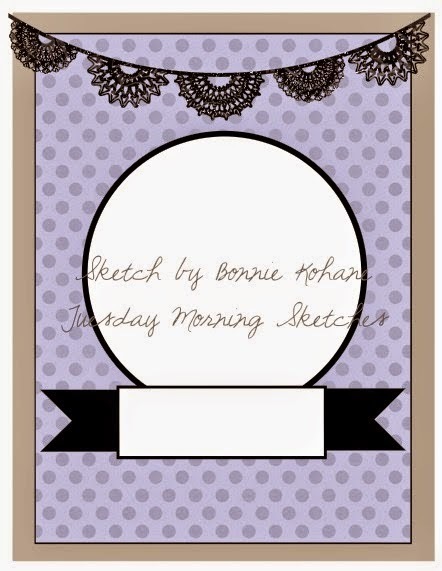 Another Tuesday is upon us which brings us a new Tuesday Morning Sketches challenge. This week’s sponsor is Stitchy Bear Outlet. I had one of my new paper pads sitting on the corner of my desk so of course is caught my eye. I struggled a bit with the sketch which is just silly because it is great. I had the whole card put together except for the banner element along the top. Then I got this idea to use my glittery twine with some pearls and I was happy how pretty it turned out. I added multiple layers behind the image and added some extra decorative pearls on the sentiment and a single one on the shoe. Supplies: Cream and brown card stock, Designer Paper-My Mind’s Eye, Stitchy Bear Outlet - It's A Girl Thing , Spellbinder die cuts, pearls, twine. Visit the Tuesday Morning Sketches blog to play along, also check out the samples created by the Design Team. 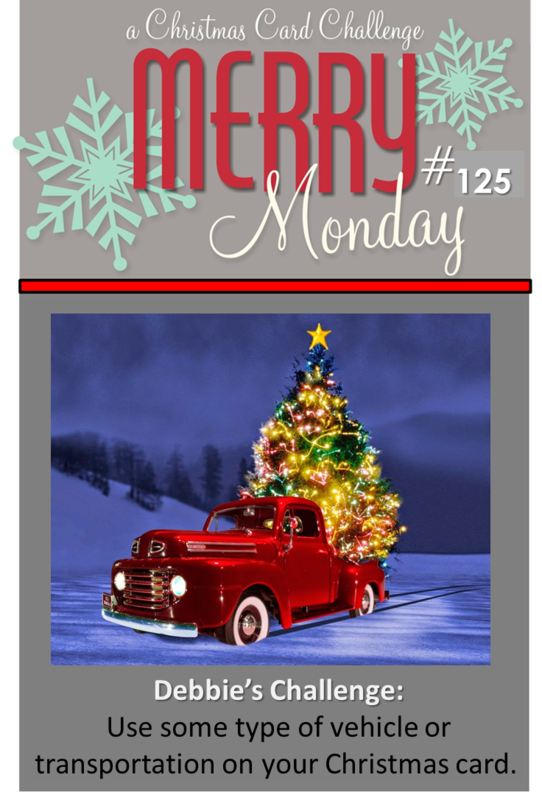 Good morning and welcome to a new Merry Monday Christmas Challenge. 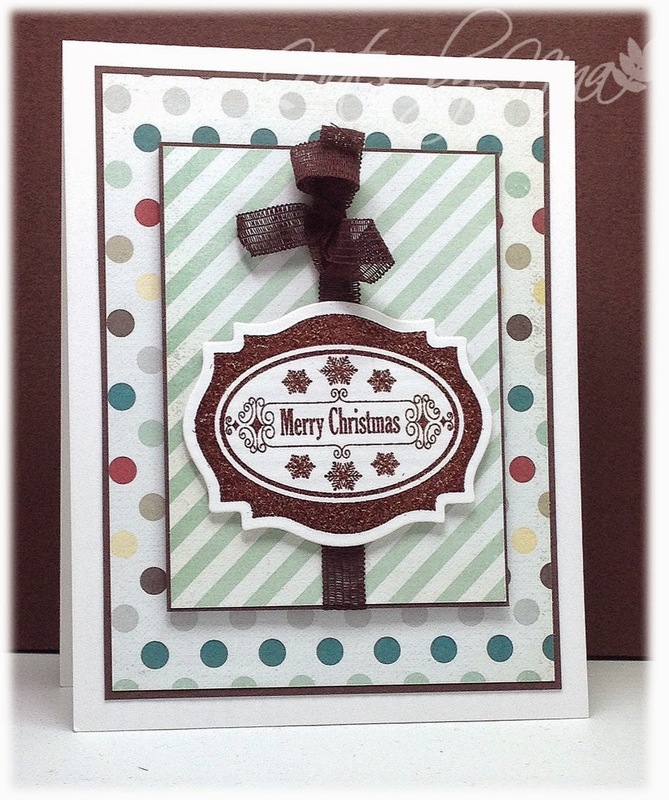 This week Katie is challenging us to Use stripes, polka dots or both on your Christmas card. 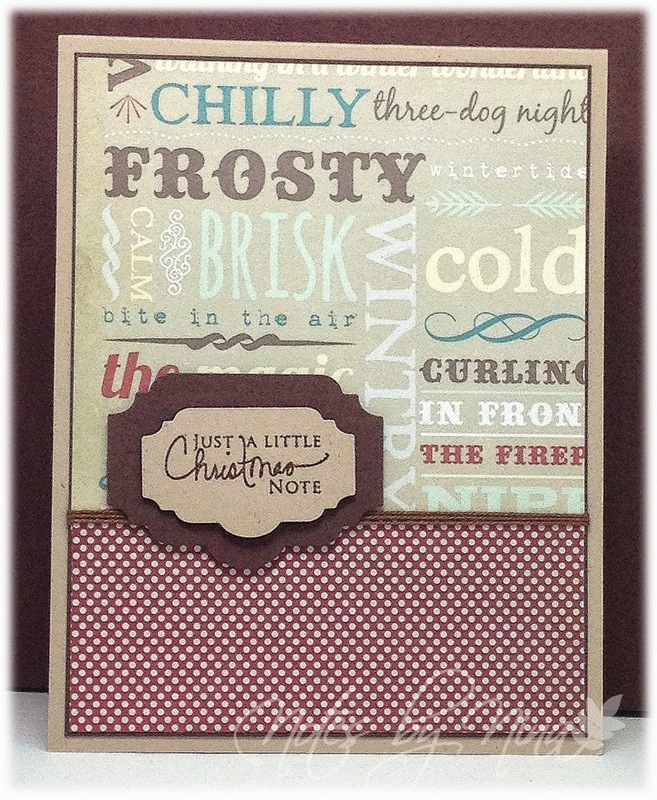 I created a nice easy card for this weeks challenge, I heat embossed the sentiment and die cut it out. The sentiment and center panel are both popped up with foam tape and I added in some curly ribbon. That is a bow at the top there but ribbon just looks scrunched for the photo. 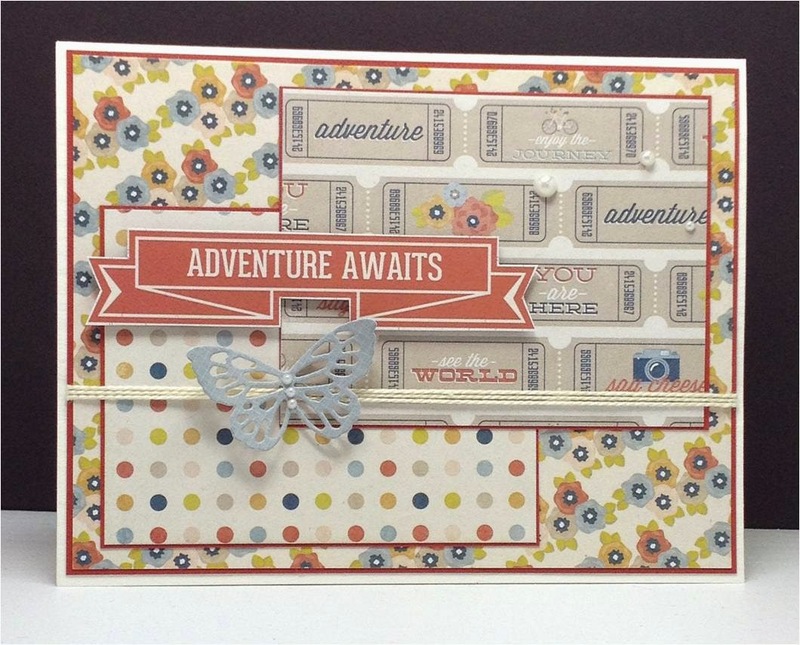 Supplies: White and brown card stock, Designer Paper –Fancy Pants , Inspired by Stamping - die cut and sentiment, ribbon. I created this card earlier in the week and it had just been waiting patiently for me to get a picture taken and post prepped. I used the current The Challenge for my inspiration. I have to admit that I struggle when using pink, so I pulled out one of my 6x6 paper pads from the hidden depths of my stash which had all the colours included. Supplies: White and black card stock, Designer Paper – Echo Park, Technique Tuesday – Live Laugh Love, misc punch, twine, sequins. I had a nice impromptu craft session with my sister this evening, a perfect end to my work week. We decided to try the current Fab Friday Sketch. 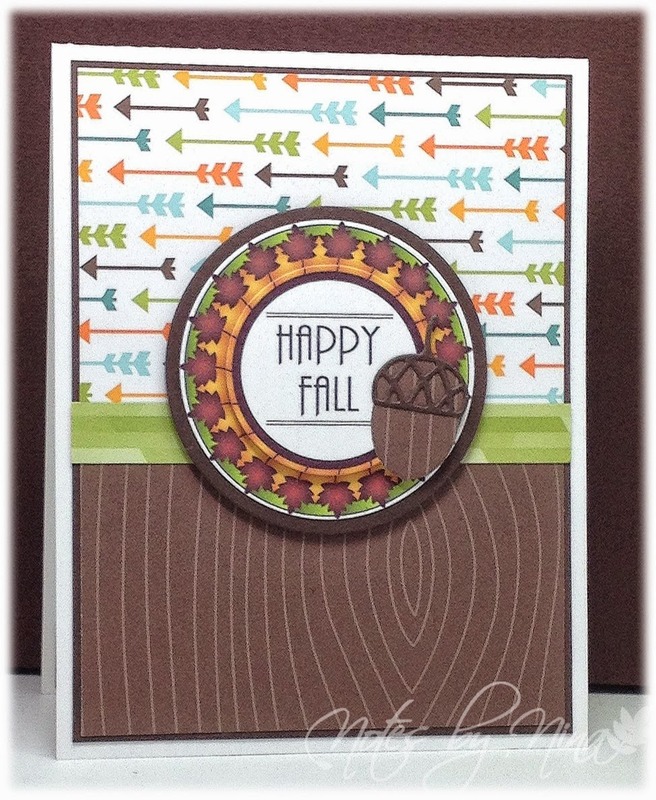 I received my September kit from Simon Says Stamps and I could not wait to try out the Coffee Cup die cut. I used lots of layers and then used three different coloured strands of twine for one of the elements. I finished with some wood grain sequins. 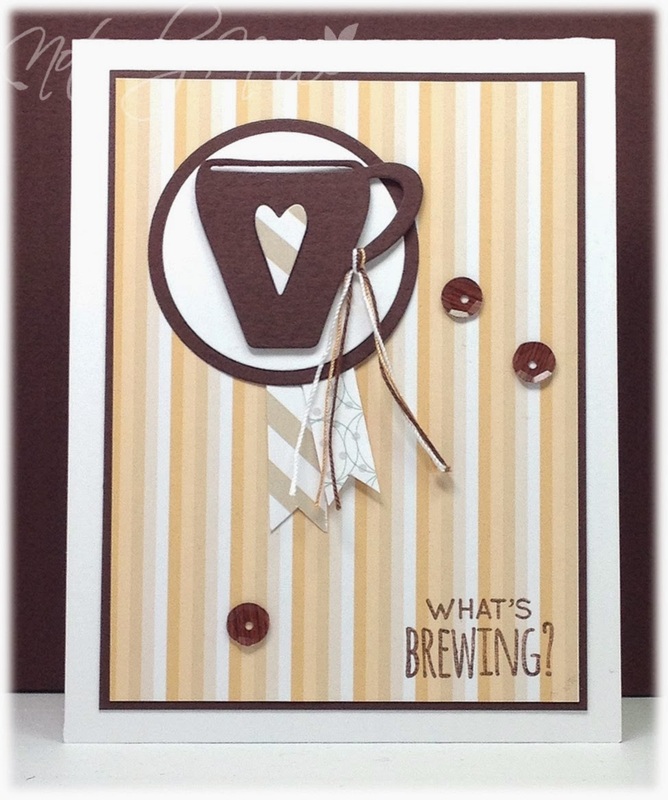 Supplies: White and brown card stock, Designer Paper – Teresa Collins, Simon Says Stamps – What’s Brewing and Coffee cup, Spellbinders, twine, sequins. It’s Tuesday and that means it is time for a new Tuesday Morning Sketches challenge. Melissa is this week’s sponsor and she is generously going to drawn a winner for a $10 Voucher to Simon Says Stamps. Our sketch this week was created by Jessi. Me being me, I had to switch it up a little so I turned the sketch around. 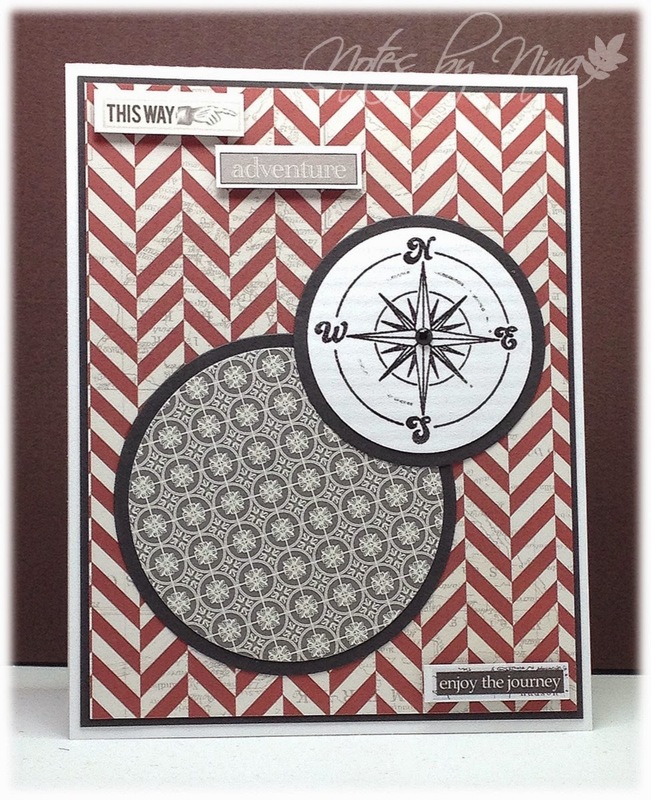 Supplies: White and black card stock, Designer Paper-My Mind’s Eye, Imaginisce - Compass, Spellbinder die cuts, pearl. 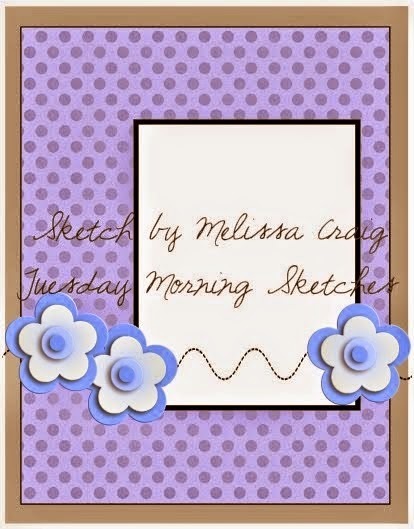 Stop by the Tuesday Morning Sketches blog to play along, also check out the wonderful creations created by the Design Team. 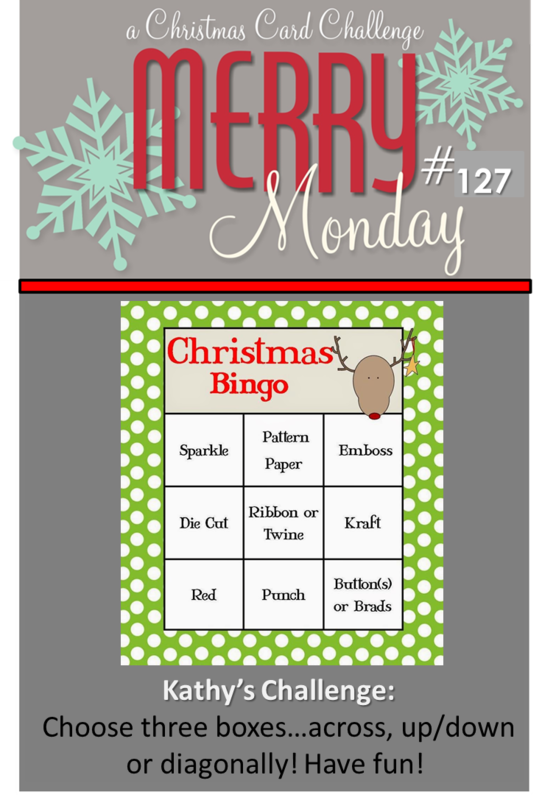 It is Monday once again and time for a new Merry Monday Christmas Card Challenge. This week Kathy is our hostess and her challenge is to Choose three boxes, up/down or diagonally. Although I think I tried to fit this card in to many of this choices as I could I went straight across the middle with Die cut, Ribbon or Twine and Kraft. I also tried for a simple layout that could be popped in the mail without extra postage. I heat embossed the sentiment then layered it and popped it up with foam tape. I used twine to divide the upper and lower segments of the card. I think I should have added some pearls or sequins and I still might but I am leaving it CAS for now. Supplies: Kraft and brown card stock, Designer Paper –Fancy Pants , Papertrey Ink– Signature Christmas, Inspired by Stamping - die cut, twine. Don’t forget to stop by the Merry Monday blog to see the Design Team’s creations, leave the ladies a little comment love along the way. When the time does come, I hope that it is the gateway to even more adventure. So I created this card as a retirement card. As normal I could not wait to tear into a new paper pad, and I don’t know about you but I can’t just use one sheet or pattern I need to play with a few which is why I love my 6x6 paper pads. The sentiment is from one of the pages an well and I die cut the butterfly which notched into the sentiment nicely. I added some twine and pearls into the mix too. Supplies: Cream and burnt orange cardstock, Designer Paper – My Mind’s Eye, Memory Box die cut, twine, pearls. 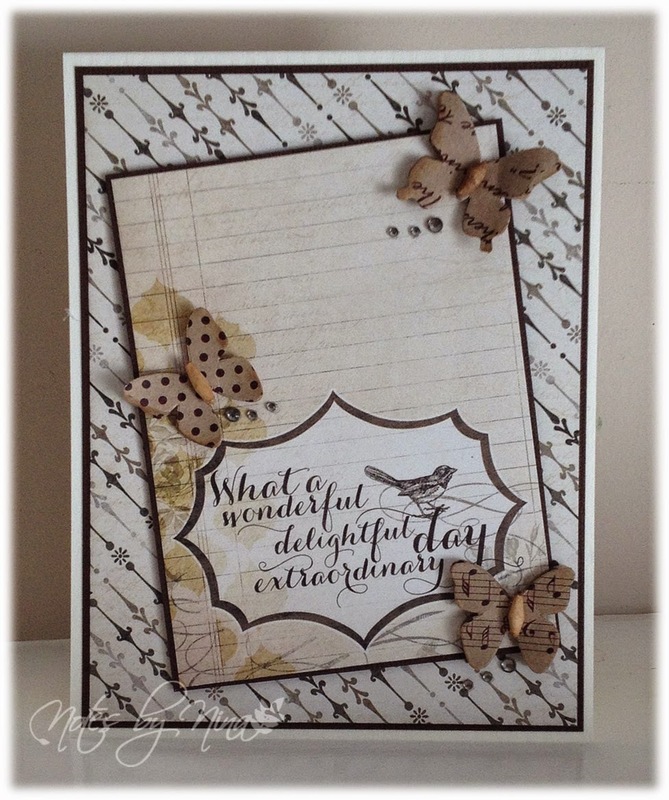 A quick card post this evening, I played along with Lesley’s current The Challenge. I had fun with these colours and the elements. I die cut a number of embellishments then finished with some sequins. 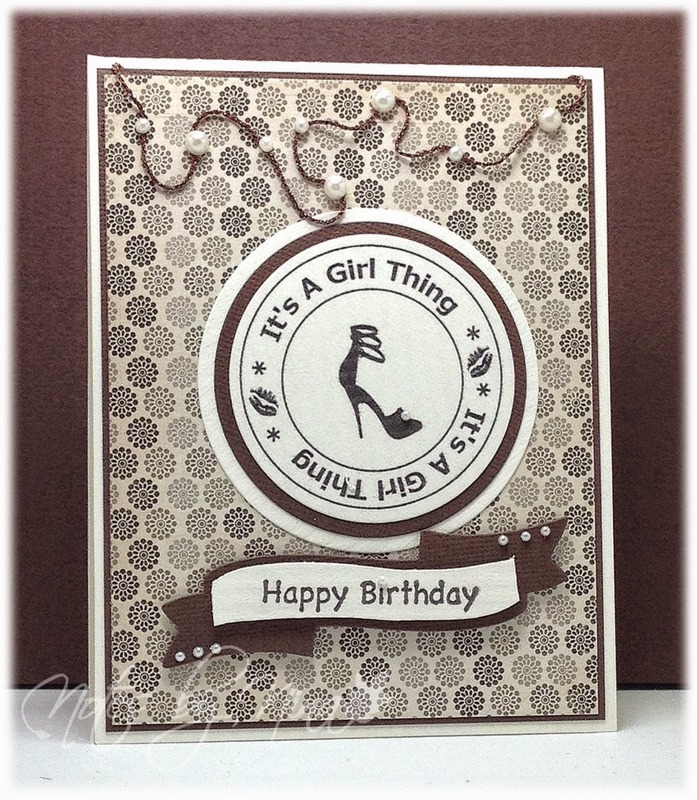 Supplies: White and kraft card stock, Designer Paper – Carta Bella, misc – Happy Birthday and die cuts, sequins. It feels like I have not created in forever, although it was just last weekend. I hope to get some time in through this week. I created this card for my sister Barb’s birthday which was on Monday, I found some fun new stuff at Michaels that was for her gift and I decided to buy the same items to make her Birthday card with them. My stash of course J.
I will admit to loving nature colours, this 6x6 paper pack had my attention from the start. Then I saw these little butterflies and I was totally done. Needless to say the paper did all the work then I simply added the embellishments. 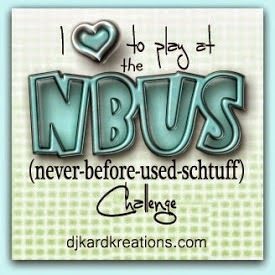 I am playing a long with NBUS#2, I missed the first one. This challenge is put on by Darnell Knauss, if you have not had a blog encounter with Darnell you should. She is fabulously creative and is generous and so sweet with her comments. The post for the current challenge rings so true for me, I too have been.. urm.. acquiring supplies faster that I am using them. I might, just may be a bit of a card making supply hoarder... just maybe. It all is just so fabulous though. Supplies: White and brown card stock, Designer Paper – My Mind's Eye, Recollections butterflies twine, gem. Happy Tuesday, its time for another Tuesday Morning Sketches. Our sponsor this week is Bugaboo. 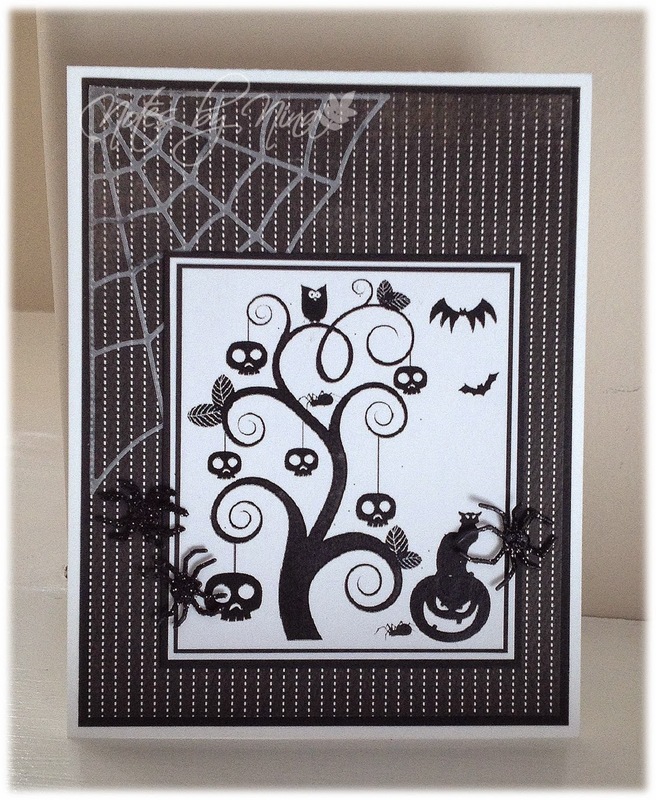 I love making Halloween cards, I don't send a lot of them out but it does not stop my fascination with them. I am using this fabulous image called Skull Tree, I layered the panel twice, the back panel is also layered and I used a die cut with some vellum for the web. I finished with some die cut spiders that I glittered up in black and popped them up. Fall is on its way, the mornings are cooler and darker :( the spiders have decided that they want vacation indoors... uggg. Sorry Legs, I don't care if sacrificing you will bring in the liquid sunshine - w 'you' making an appearance you are going to get a squish and swim down the swirl bowl. My son read somewhere when he was 9 or 10 that chestnuts will keep spiders away, we have an abundance of chestnut trees in our area and come fall I would see the corners of his room start to acquire nuts. I have no clue if it really works but he was determined right through to when he left home. Note: Chestnuts are not good for the Vacuum cleaner. Looks at me ramble.. sheesh. I will stop now :). Supplies: White and black card stock, Designer Paper - Carta Bella, Vellum, Bugaboo - Skull Tree, Memory Box die cuts, glitter. 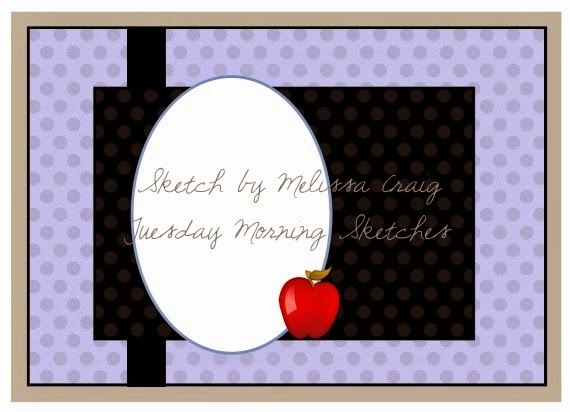 Stop by the Tuesday MorningSketches blog to see what the Design Team had created. We would love for you to play along, we like everyone else love some commenting love :). 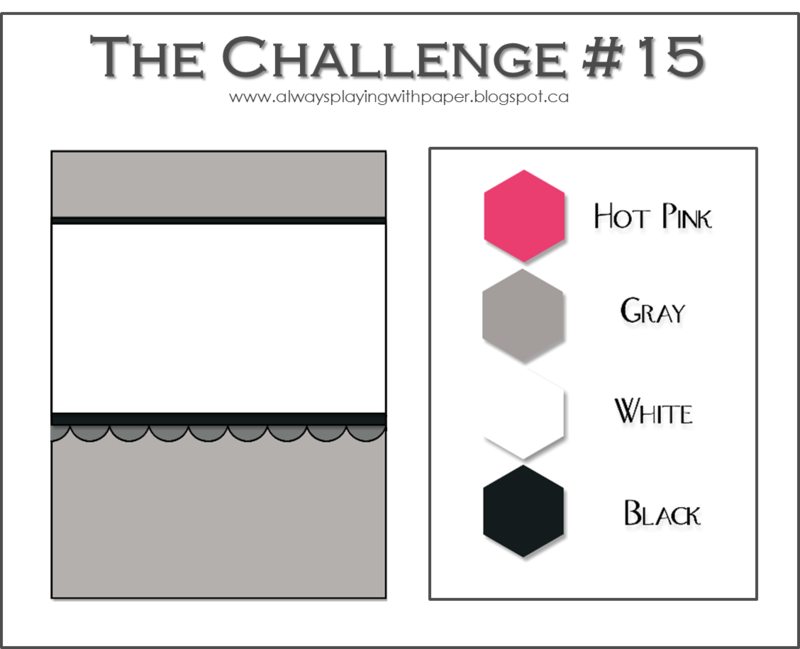 Good Morning and welcome to a new Merry Monday Christmas Challenge. This week Karren is challenging us to Make the sentiment the star of your Christmas Card. I have so many wonderful Christmas sentiments so this week's theme worked out great for me. 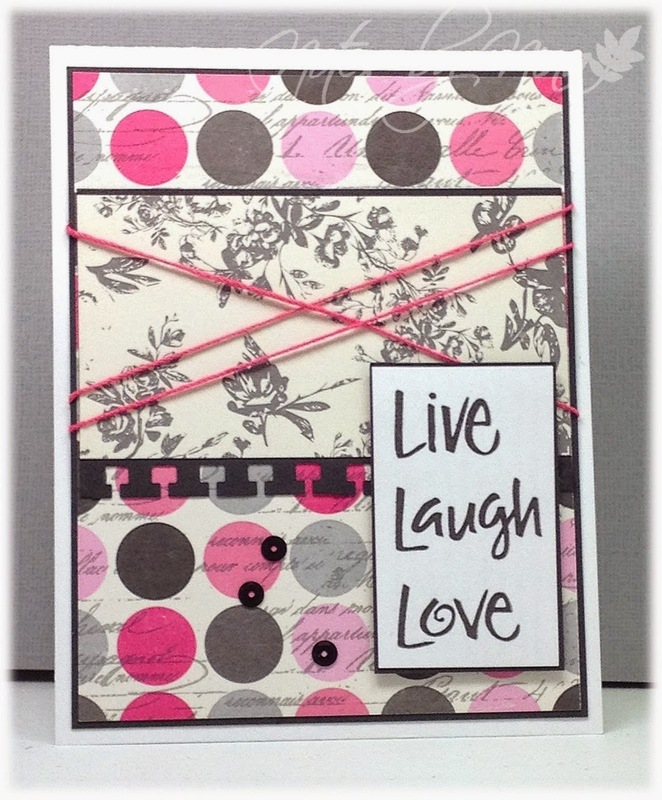 I chose a simple layout, I heat embossed the sentiment then layered it and popped it up. I added some sheer ribbon to finish. 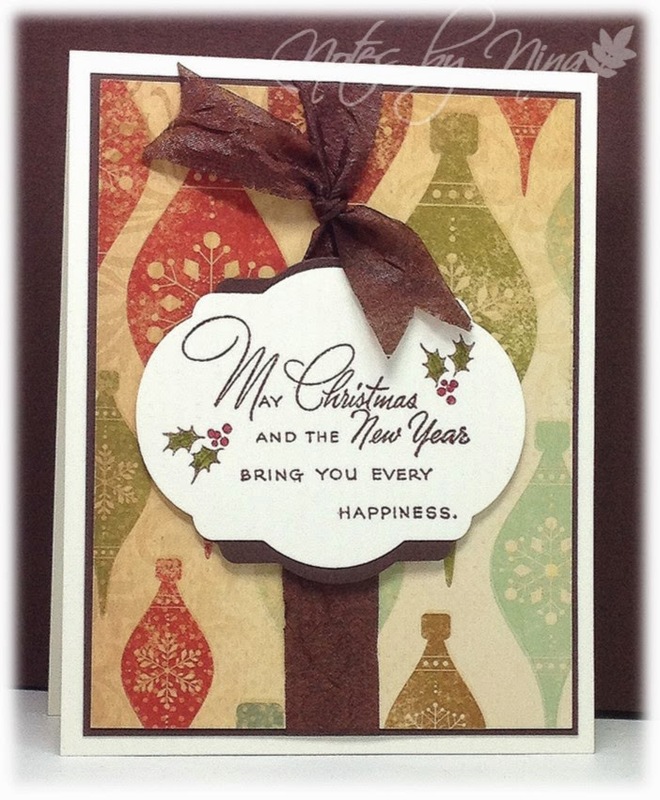 Supplies: Cream, brown and brown card stock, Designer Paper – Kaiser Craft, Stampendous - Christmas Wishes, ribbon. 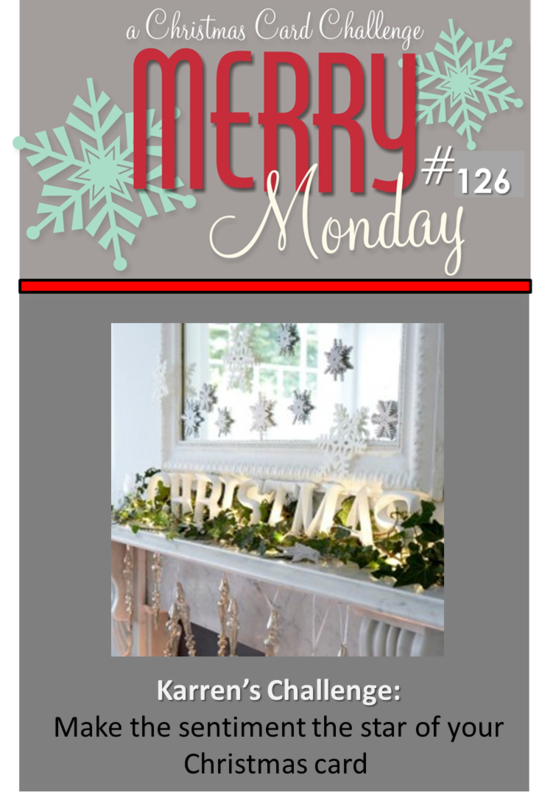 Stop by the Merry Monday Christmas Challenge blog to see all the wonderful inspiration that the design team has created. It’s Tuesday and that means it is time for a new Tuesday Morning Sketches challenge. Our sponsor this week is Deedee's Digis. This challenge is also judged as it has a twist which is Back to School. I made this card for a special little girl starting school this week. I thought this fish was too funny. I used some designer paperI have had in my stash for a long time and I was so happy it matched nicely. 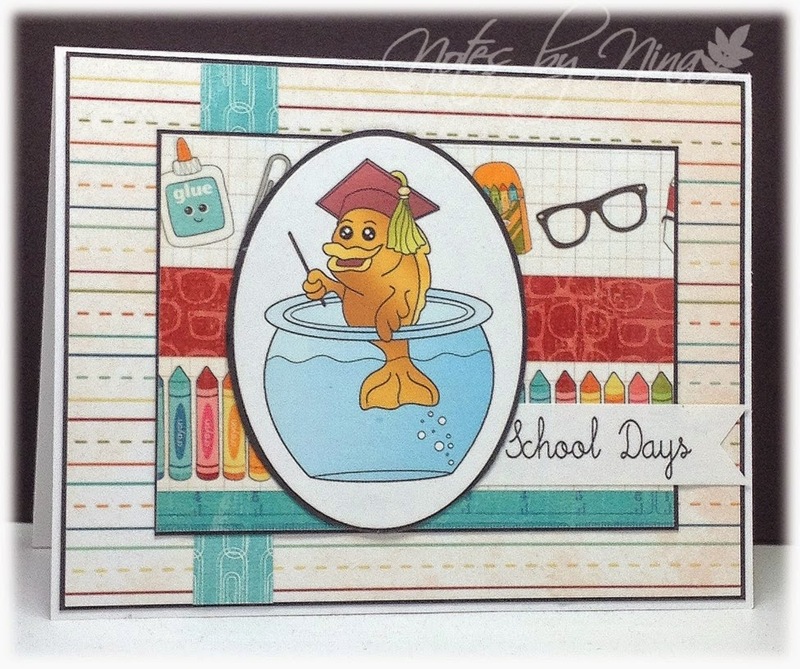 Supplies: White and brown card stock, Designer Paper-Imaginisce, Deedee Digi – Teacher’s Pet, Spellbinder die cuts. 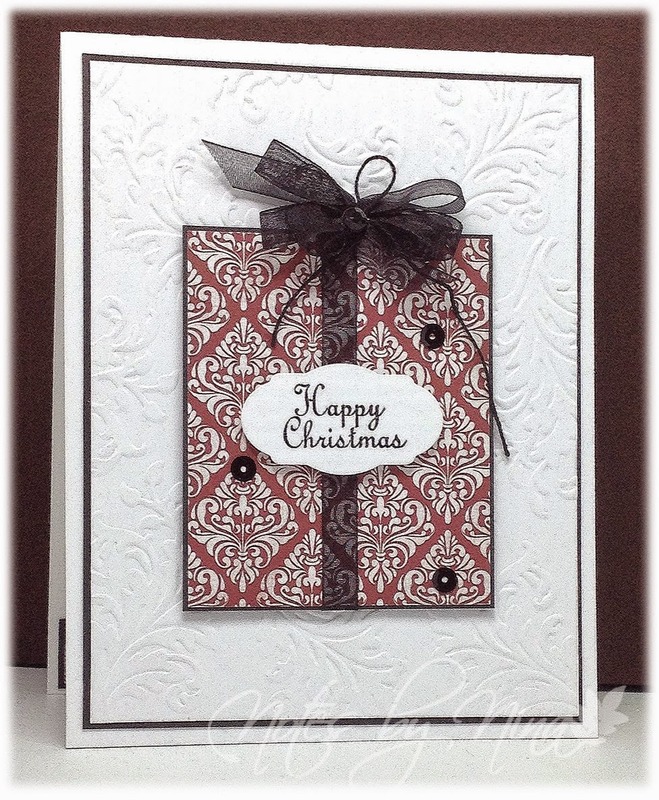 Its Monday once again and time for a new Merry Monday Christmas Card Challenge. I have a nice stock of Christmas cards now and I love it. This week Debbie is our hostess and her challenge is to Use some type of vehicle or transportation on your Christmas card. I had a good laugh and head shake at myself and when I sifted through my stamps time and time again thinking I was going to resort to sleigh when I duh I have this cute little train. I stamped and fussy cute each little section, I added some vellum to the windows and popped them all up with foam tape. I added a little twine to cover the paper seam and then die cut the sentiment. 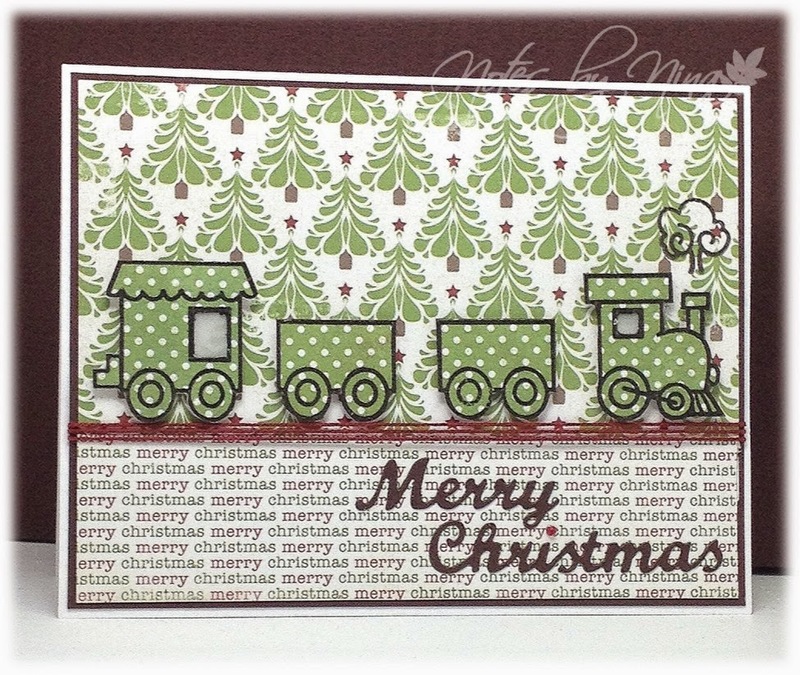 Supplies: White and brown card stock, Designer Paper –Carta Bella , The Alley Way Stamps – Christmas Express, Elizabeth craft designs - Merry Christmas, twine. I spent a good 2 hrs cutting card stock and scoring them for card bases, I have a good selection now but it sure takes a bit of time. I still wanted to craft after that and I took a look at the current Freshly MadeSketches challenge and the sketch look simple enough.. till I made it difficult. I printed out this cute little bear twice and fussy cut it out. I had thoughts of grandeur and tried to create a fuzzy blanket for under it. First tried to use ink on a small piece of white felt (what a mess) tried the same with a dryer sheet.. wow (huge mess). Needless to say the blanket idea was ditched. So I ended up with the sentiment stamped, the card stock embossed and some twine and button to fill in the white space (big bad white space). Foam tape was used generously on the panel and the bear with its double layer. Please excuse the darker image, I have been challenged with my camera the last month. Supplies: White and brown card stock, Designer Paper – DCWV, C.C. 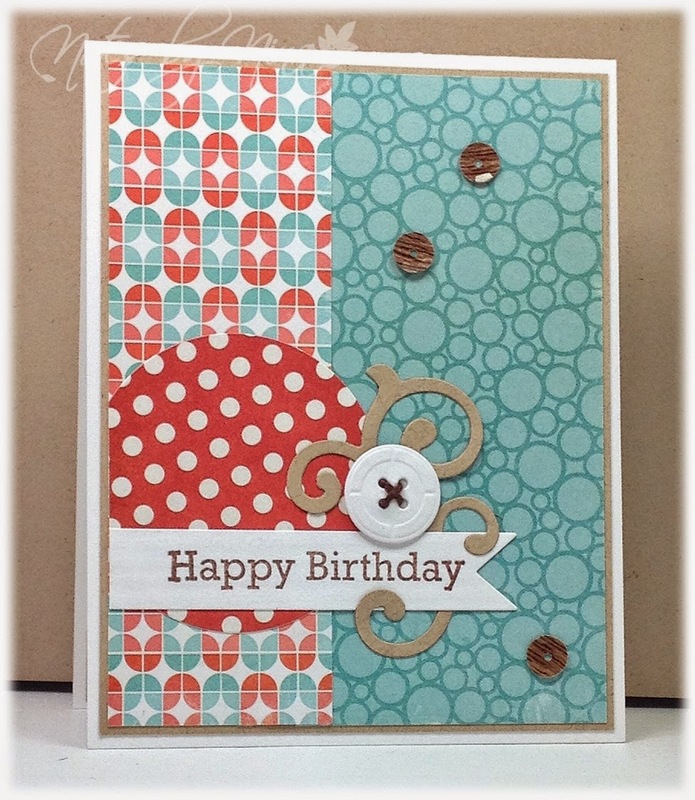 Designs – Bear Hug, twine, pearl, button die cut. 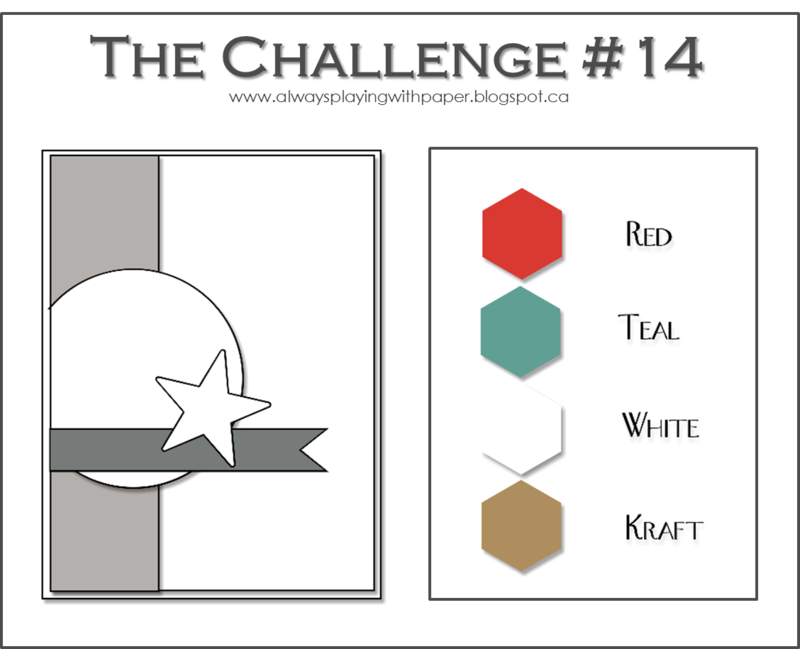 My sister tossed out a family challenge, this one is to use paint samples on our cards. I have a nice little stack of these, most are thin with letting on them but I have a few that are large square. They happen to be nice fall colours so I thought they would be perfect for an Autumn card. I used the mini Chicken Wire die cut and pieced together a mosaic of sorts using a deep read, burnt orange, yellow, sage green and deep green. I added in some twine and a heat embossed sentiment that I popped up. The paint samples reflect the light oddly so the picture did not turn out as I expected. 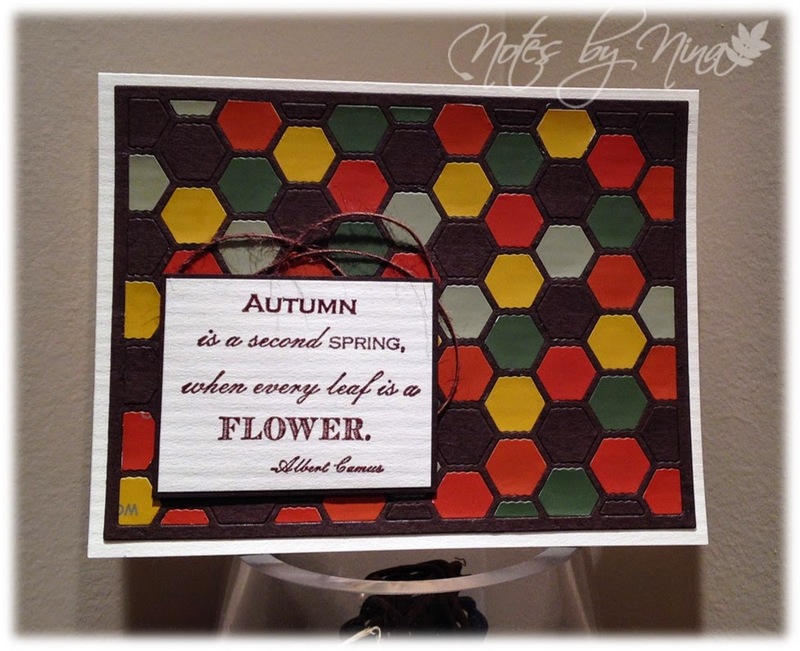 Supplies: Cream and brown cardstock, Heart Art Studios – Autumn Quote, MFT – Mini Chicken Wire , twine, paint samples. Take a look at Barb and Judy’s blogs to see what they have come up with. It’s Tuesday and that means it is time for a new Tuesday Morning Sketches challenge, this week we get to choose a sketch. Our sponsor this week is Digital Delights by Looby Lou. I love this simple layout, I printed off this great image (pre-coloured) and cut it out with circle dies. I have the center piece separated popped up with foam tape for a 3D look. I finished with a cute little acorn. Supplies: White and brown cardstock, Designer Paper - Lawn Fawn, Digital Delights-Leaft Happy Fall, Spellbinder and Memory Box die cuts. Happy Monday, it is a holiday Monday – who doesn't like a long weekend. 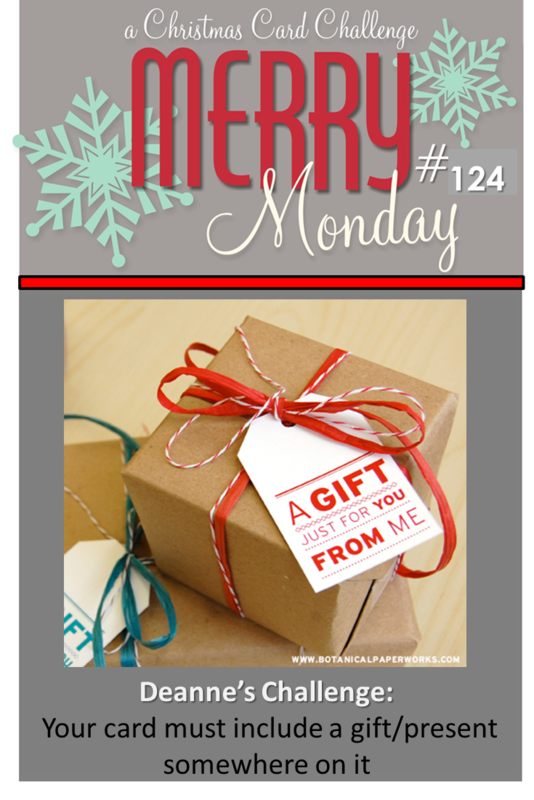 It is time for a new Merry Monday Card Challenge – our hostess is Deanne this week and the Challenge: Your card must include a gift/present somewhere on it. I had this vision of what I wanted this card to look like in my head, I like how it turned out but I am not sure it is how I wanted to turn out. I started with a nice DP and layered to with a thin black layers, I added some shear ribbon and a little twine. 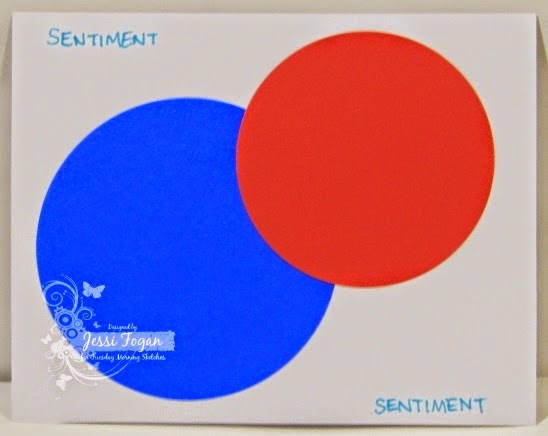 I added a simple sentiment in a shape that looks like it might be a tag and added some sequins. I finished my popping it all up with foam tape and adding a textured layer. Supplies: White and clack cardstock, Designer Paper – Kaisercraft, Happy Christmas – Unknown, embossing folder, ribbon, twine, sequins. 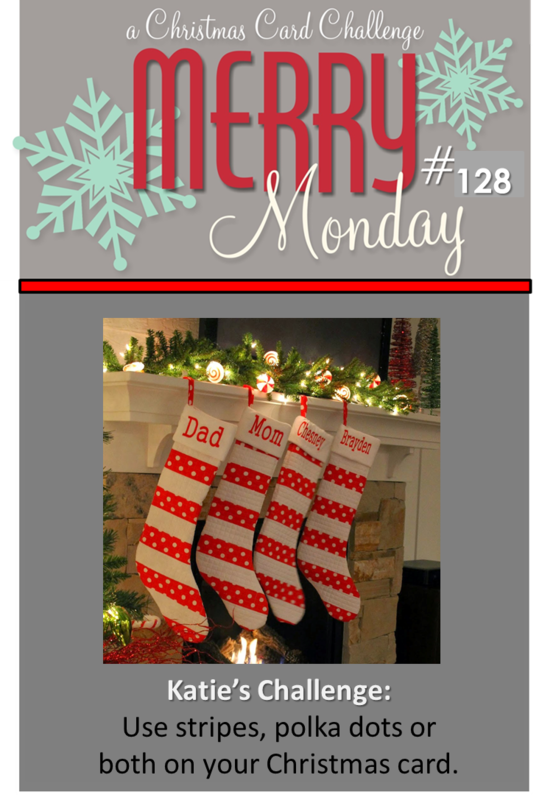 The Merry Makers have some wonderful samples to share so take a look at the Merry Monday blog. We would love for you to play along with us.